It was always going to be a straight race between Lionel Messi and Cristiano Ronaldo to surpass Raul’s Champions League goalscoring record, and it was the Barcelona star who when past the line first after grabbing a brace against Ajax in November. A hat-trick against Apoel the following week saw Messi become the new record holder, taking his tally to 75 with another goal in Barca’s final group game against Paris Saint-Germain. Messi became the Champions League leading scorer just days after taking the same accolade in La Liga, and 2014 was another year of accolades for the Argentina star. Messi holds a number of records in the Champions League and it seems fitting that he is now the competition’s new leading scorer. As well as being the leading scorer, Messi was the first player to score five goals in a single Champions League match, as well as holding the record for scoring the most hat-tricks in the tournament with four – coming against Arsenal, Viktoria Plzen, Bayer Leverkusen and Ajax. Having previously surpassed Gerd Muller’s record of scoring 91 goals in a calendar year, there are only a few records left for Messi to break. While Ronaldo might have been in incredible scoring form in both La Liga and the Champions League, Messi’s record in Europe has seen the likes of betfair still tipping the Barcelona star to finish as the tournament’s leading scorer this season. So, from his 75 goals in the competition, let’s have a look at the ten best Champions League goals Messi has scored during his career. While the goal itself might not have been as eye-catching as others, the goal that saw Messi finally draw level with Raul on 71 Champions League goals was the epitome of what the Argentine is capable. After opening the scoring just before half-time, Messi never gave the Ajax defence a minute’s piece over the next 40 minutes before grabbing his second of the game on 76 minutes. From collecting the ball out wide, Messi effortlessly explored the Ajax defence before sending a pass out to Pedro on the left-hand side of the box. The Spain international took one touch and fired the ball back across the box where Messi found space behind the Ajax defence to slot home. It wasn’t just that Messi started and finished the move, but more the fact that the forward seemed to know exactly what he, Pedro and the Ajax defence were going to do. From his movement with the ball, his vision to see his team-mate in space, the awareness to slip in behind the defence and placing the ball past Jasper Cillessen in the Dutch side’s goal – the whole move was created and executed by a player who tormented the Ajax defence throughout the game. In one of the best performances of his career, it was Bayer Leverkusen who found themselves on the wrong end of a 7-1 hammering by Barcelona, in a game that saw Messi score five goals, four of which could have found themselves in this countdown. After a destructive first half in which he had scored twice, it was Messi’s hat-trick goal shortly after half-time that really took the biscuit, taking the game beyond Leverkusen with one of his trademark chips. After two delightful goals in the first half, Messi made it 3-0 to Barca in fabulous style. Latching onto a pinpoint ball over the top from Xavi, the Argentine controlled the ball and placed a lovely chip over the onrushing Leverkusen goalkeeper. While the goal was impressive enough, the fact Messi finished with his supposed-weaker right foot really made this finish that extra bit special. Two more goals followed for the forward in the second half as Messi became the first player to score five goals in a Champions League game. 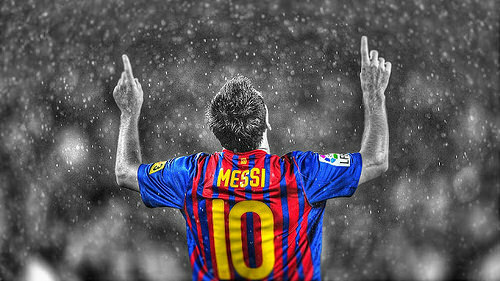 Messi hasn’t scored that many headers in his career, but the ones he has done have certainly lived long in the memory. Heading into the 2009 Champions League final against Manchester United the teams had been quite evenly matched with the bookies, but Messi had been almost the sole focus of attention. The Argentinian certainly didn’t disappoint, playing a major part in Samuel Eto’o’s opener before grabbing a crucial second goal in the 70th minute with a stunning headed goal. Trailing 1-0 deep into the second half, Manchester United manager Sir Alex Ferguson had thrown on Dimitar Berbatov in the hope of finding an equaliser. Just when it looked like the Premier League club were threatening to level the game up, Messi found space between the United defence to crash home a Xavi cross with one of the best headed goals you’ll see. The goal killed off any hope the English side had of getting back into the game and a second Champions League winner’s medal soon followed for Messi. In what was another successful season for Messi in Europe, it didn’t take long for the forward to get going in the Champions League. The forward scored both goals in the 2-0 victory over FC Copenhagen in Denmark, but it was the first which has been shown again and again on Messi montages. While Messi has become famous for dribbling the ball past eight defenders before dinking it over the goalkeeper, the little attacker is more than capable of putting his laces through the ball. His first against Copenhagen certainly fits into that category. While Barcelona mounted another early attack, Messi stayed out of the action and kept himself open. Receiving the ball about 30 yards from goal, the Argentinian weighed up his options before lashing home an unstoppable shot from the edge of the area. The goalkeeper, to his credit, made every effort to reach the shot, but that dive only made the goal look even more impressive, and it was unsurprising to see some Copenhagen fans applauding the finish. The start of the journey. Lionel Messi’s Champions League scoring run started way back against Greek giants Panathinaikos in November of 2005. While Barcelona fans had seen signs of what Messi could do, it wasn’t until he scored in the Champions League before many football fans around the world had chance to witness the birth of one of the best players of a generation. With Barcelona beginning to form the team that dominated European football for over half a decade, Messi had arrived in the first team with plenty of expectation on his shoulders. The 2005/06 season showed just what all the fuss was about. Coming off the bench against Panathinaikos with Barca 2-0 up, Messi grabbed his side’s third with a sumptuous chip over the goalkeeper as the Spaniards went on to record a 5-0 victory in a game that saw the start of Messi’s European exploits. If ever Barcelona needed Messi it was against Arsenal in the quarter-final of the 2009/10 Champions League. With the tie 2-2 after the first leg, Barca found themselves 1-0 down and in danger of being overrun by a rampant Arsenal side. Messi cut a frustrated figure for much of the opening stages of the game, and it was disappointment that seemed to fuel the Barcelona maestro as he levelled the game up and turned the tie on its head. After cutting in from the right, Messi attempted to play a ball through the Arsenal defence only for it to be cut out. Appearing angry at his misplaced pass, Messi absolutely crashed home the ball as it rebounded to him, flying past Manuel Almunia in the Gunners’ goal and giving the Spaniard no chance. Arsenal were beaten from then and Messi ended up taking home the match ball as Barca ran out 4-1 winners and progressed to the semi-finals. Another occasion when his side needed him, Messi proved his world-class credentials with another man-of-the-match performance in the Champions League. Having drawn the first leg against Stuttgart in Germany in their round of 16 clash in 2010, Barcelona needed to make sure they didn’t slip up at home at the hands of a talented German team who had looked more than capable of springing a surprise and dumping out the eventual champions. Once again, it was Messi who proved to be the difference, scoring twice as the hosts ran out 4-0 winners on their way to the title. Linking up well with Yaya Toure in the Barcelona midfield, Messi found himself running towards the Stuttgart defence before making Zdravko Kuzmanovic and two other Stuttgart defenders look silly to slot the ball past Jens Lehmann in the German’s goal. Arsenal have felt the wrath of Messi more than most in the Champions League and it was a similar story in the 2010/2011 tournament. The Premier League side had thought they were about to finally get one over on Pep Guardiola’s men after winning the first leg 2-1 at the Emirates. Wenger’s men looked to be in decent shape with the game heading into half-time, until Messi popped up to spoil things again for the North London side. Following good work from Andres Iniesta, Messi drifted into space in the box and collected a wonderful chip from the Spanish playmaker. While that move was impressive enough, what followed was one of the best finishes in recent memory. After bringing the ball down, Messi flicked it over the onrushing Arsenal goalkeeper and slotted the ball home in the final minute injury time of the first half. Once again, Messi’s goal was the catalyst for Barca to go on and secure the victory as Arsenal were left wondering just when they were going to get through a Champions League campaign without the Argentine dashing their hopes. In what was perhaps Messi’s defining performance in the Champions League, AC Milan are still asking themselves what happened in the second leg of their last-16 tie against Barcelona. The Italians had looked sensational on their way to a comfortable 2-0 victory at the San Siro in the first leg. Barcelona looked to be on their way out of the competition at the first knockout stage at the hands of a Milan team who hadn’t been expected to achieve much that season. Knowing they needed to get off to a good start if they were going to overturn the 2-0 disadvantage, Messi wasted little time in ensuring Barcelona progressed to the quarter-finals and the Italians were left wondering what might have been. Just five minutes into the game, Messi played a one-two with Xavi and found enough space amidst three Milan defenders to bend a lovely, left-footed curler home. A second came in the 40th minute and the La Liga side ran out 4-0 winners to finish the two legs 4-2 victors, with Messi again playing a huge role in Barca coming back from the brink. Scoring a goal in the semi-finals of a Champions League is special enough, but doing it as a Barcelona player against Real Madrid can result in a player earning legendary status. While Messi hasn’t had to worry about his legacy for a few years, his brace against Real Madrid in the first leg of the semi-finals in 2011 will live long in the memory of football fans across the globe. In a bad-tempered game at the Bernabeu, two late goals had added some beauty to a pretty ugly spectacle. While his first was a well-taken finish, Messi’s second could well go down in Champions League history as one of the tournament’s best ever goals. After embarking on one of his typical slalom runs, Messi popped the cherry on the cake with a delicate, right-foot finish that broke Real Madrid fans’ hearts and gave Barca the impetus to go on and reach the final.